German economist, author, and member of the Prussian Diet; born in Berlin, Oct. 10, 1854. He graduated as Ph.D. from the Berlin University and soon entered on a literary career, identifying himself with the Ultraconservative elements of Prussia. He was the foremost advocate of bimetalism, protective tariffs, and of that policy generally the trend of which is toward preservation of the quasi-feudal remnants of the Prussian State. So unswerving was his loyalty to the Conservatives that he abandoned his religion, embraced Christianity, and sometimes employed anti-Semitic phraseology. 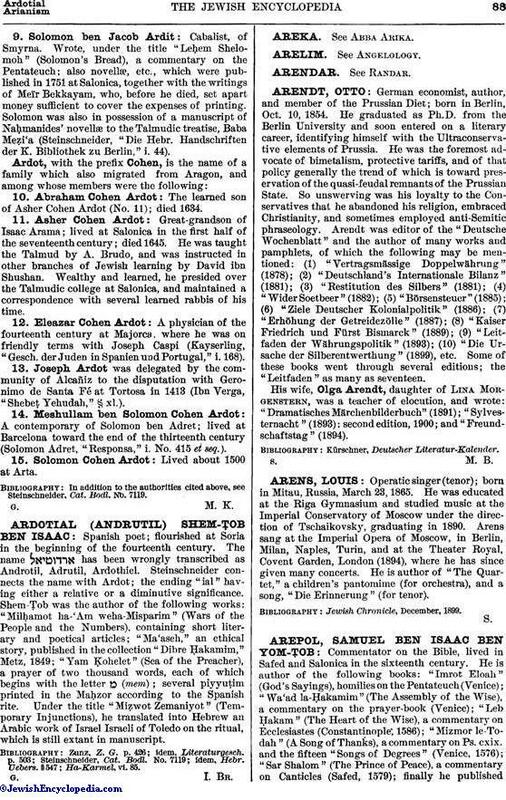 Arendt was editor of the "Deutsche Wochenblatt" and the author of many works and pamphlets, of which the following may be mentioned: (1) "Vertragsmässige Doppelwährung" (1878); (2) "Deutschland's Internationale Bilanz" (1881); (3) "Restitution des Silbers" (1881); (4) "Wider Soetbeer" (1882); (5) "Börsensteuer" (1885); (6) "Ziele Deutscher Kolonialpolitik" (1886); (7) "Erhöhung der Getreidezölle" (1887); (8) "Kaiser Friedrich und Fürst Bismarck" (1889); (9) "Leitfaden der Währungspolitik" (1893); (10) "Die Ursache der Silberentwerthung" (1899), etc. Some of these books went through several editions; the "Leitfaden" as many as seventeen. His wife, Olga Arendt, daughter of Lina Morgenstern, was a teacher of elocution, and wrote: "Dramatisches Märchenbilderbuch" (1891); "Sylvesternacht" (1893): second edition, 1900; and "Freundschaftstag" (1894).